Invite friends to Google Tez App and get free Rs.51 per invite. All you have to do is redeem Google Tez Referral Offer. You’ll each get Rs.51 when your friend makes their first payment. Invite anyone to Tez, a new payment app by Google, and you each get Rs.51 when your referral makes their first payment. Just share your unique invite link and make sure that your referrer downloads the app from your unique link. OFFER DATES: Offer expires 1 April 2018. Download and Sign up on Google Tez here. Enter the mobile number registered with your bank accounts. Then make your first payment to your friends or family (say of Rs.1 only). That way you will get Rs.51 Cashback. 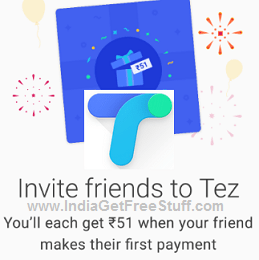 Invite Friends to Tez: Get Rs.51 per invite using Google Tez Referral Offer. When your friend makes their first payment both of you will get Rs.51 each transferred directly to your registered bank account. Scratch Cards Offer: Send or receive Rs.150 or more and get a scratch card worth up to Rs.1000 for each sender-recipient pair per week. Each Tez App user can earn a maximum of five such Tez rewards per week. Travel with Tez: Get a reward for completing 3 payments of Rs.150 or more at Uber or RedBus. Tez cutsomers will get only one reward of this kind. Reward will be of a value between Rs.50 to Rs.500. Lucky Fridays Scratch Card Offer: Send Rs.500 or more to another app user and get a scratch card that could reveal Rs.1 lakh reward. Invites friends must sign up through your unique Tez invite link. Your friend must successfully complete a payment using Tez app. You and the invitee will receive Rs.51 each in your respective bank accounts. As such, you and your invitee must have a UPI-enabled bank account attached to your respective Tez accounts to receive payment from Google. Rewards will only be paid for inviting the same person once. Each App user can earn a maximum of 50 referral rewards. Benefits of Tez Payments App: Tez is Google’s new digital payment app for India. Send money to friends and family. Instantly receive payments directly to your bank account and pay the nearby café and shops. The app is based on NPCI’s (National Payments Corporation of India) Unified Payments Interface (UPI) which makes money transfers simple and secure via this app.